The road is open for you, my dear! But time runs out for me. So, here is a new test and trial for you: a very hard one, I tell you: the karai-yatra. If you can do it, even in parts, which means in not too hard a sequence for you, it will be very good for your Guru and Mike, Aiyar and all those who are really sincere in following The Path! I gave you the timetable out of love for you. Now it is up to you, to act! If you come, I must warn you: it will be hard going for you. For me, too. It is my 25th jubilee pilgrimage, and with the help of the Mother's Grace (Virgin Madre!) and yours, I hope to complete it at Valliamma's sacred hill. After this my "mission" in Lanka will be completed and I will set out to the ‘Hieric Islands' for the last "flight of the alone to the Alone". 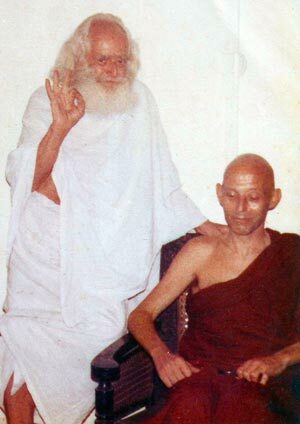 The Mike referred to was Mike Wilson who became Siva Kalki Swami in later life and Aiyar was Aja Iskander Schmidlin, the Swiss German artist who became Bhikku Sumedha who lived the last decade of his life in a cave near Kandy, both of whom were greatly influenced by Swami. I responded positively to Swami's letter and, as suggested, walked the Yatra with him from Pottuvil to Kataragama. Accompanying Swami on this his last Yatra was also the great dancer Chitrasena. From Kataragama we proceeded as said in the letter to Vallimallai the hill beyond Wedasittikanda where Mike and Aiyar were living in a cave. In a symbolic gesture Gauribala Swami disrobed and draped his kavi cloth on me which I kept on for a day or two before returning to my faded jeans. From then on Swami would only wear white. As he had stated in his letter he was free, but I found that I had been bound by the magic of the Pada Yatra, until I helped to revive it in 1989 for the Kataragama Devotees Trust that I founded to continue this ancient tradition. I found that a few of my ancestors had also participated in the Yatra in the past which had been abandoned for a few years due to the increasing hostility en route. From two of us in Nainativu or Nagadipa to a few more in Mullaitivu to twelve in Trincomalee to 40 devotees reaching Kataragama, it grew. I handed over my obsession of keeping this ancient tradition alive to the American Patrick Harrigan. He had walked with Swami all the way from Selva Sannithi, Jaffna in 1972 and since 1989 has continued with it for twenty years. This year was the 20th consecutive Pada Yatra since the recommencement of this tradition, and now it happens spontaneously.